EDITORIAL NOTE: To understand how we do our reviews, please refer to our review of Revolution, here. To see Shawn’s original review of Elementary, go here. I don’t fancy the “Police Procedural” like I used to. Turning the tables on me though is Robert Doherty who is known for his exceptional work on Star Trek: Voyager and Medium. After hesitantly working up the nerve to watch a show which re-invents the famous Sherlock Holmes I’ve decided that while taking a few liberties and risks, Elementary is a slightly above-average crime show. Taking into mind that the BBC is light years ahead of CBS with their modern adaptation of Doyle’s iconic Detective with Sherlock, I still found some things to like here. I admit that I was very critical of CBS attempting this show. I, like Shawn and others, felt it was a blatant attempt to cash-in on the popularity of an already established “Reboot” or “re-imagining” started by Stephen Moffat. First off, I was a bit thrown off by the casting of not Sherlock, but Watson. When they announced Miller I felt that it was an appropriate casting choice. Miller’s cool in my book. I’ve enjoyed his work going way back to Dracula 2000 and on. I believe I had issue with Watson being changed genders. Watson as the stoic male counterpart has always worked before so why change it? Well, I decided to accept Doherty’s take and I’m glad that I did. Kind of. I won’t get into the chemistry between Miller and Liu too much here. It is a bit clunky at first but as each episode passes they start to gel. Watson is Holmes’ live in companion who is also an ex-surgeon. She needs to keep an eye on Holmes since he is in early addiction therapy. Some interesting moments between them include the often shown attendance of NA and AA Meetings meant to help Holmes with his rehabilitation. From the pilot and further episodes it’s established that Holmes is combative, quirky and an isolationist. Jonny Lee Miller is very well capable dealing with the somewhat timid and redundant material and themes that he’s been given but I do like that he likes to pick locks and has decided to never pick up playing the violin again. Miller displaying his “Sherlockisms” is accurate and unconventional of course. Not much of the actual “essence” of the traditional Sherlock is displayed here. It comes in spurts. Doherty’s take falls into some conventions that can’t be helped but to be compared to other shows of it’s ilk like CSI and such. Despite my getting used to Liu and Miller there are times I wish that the crime solving was a bit more interesting and involving. Some of Doyle’s Holmes’ is on display here, especially regarding the addiction and obsessions. Holmes is quick, smart, perceptive and a social stooge. He’s brilliant but has absolutely no people skills. These aspects of the show are interesting. The crimes and stories in my opinion should have a bit more of a punch. Aidan Quinn is just hands down brilliant as Captain Gregson. He’s fun to watch and even manages to steal a scene here and there. He provides simply placed drama playing against Miller. In one episode, he is forced to admit to Holmes that he has always known about his drug addiction. It is simply Quinn at his best. He acts with his eyes (I know it sounds weird) which is very fun to watch. Quinn plays the grizzled and work weary Captain to a “T.” He relishes having Holmes around, though, to help him with the mysterious and baffling cases. I’m five episodes into this season and I have grown to like the show a bit more than I did upon watching the pilot. My problem with the show is well… Lucy Liu. I have a kind of love/hate relationship with Liu’s interpretation and evolution of Watson. I got used to the gender change but I think that Watson is the most under-written character of the show. I do admit that we get to know about her much more in the later episodes. This is from Sherlock consistently picking her apart all aspects of her personal life from her love life to her now defunct medical career. Her role needs a bit more meat with more conflict and more revelations. Maybe I am being impatient but in keeping with the spirit of Doyle’s Watson we should have had some more of a hands on feel for Watson and her inclusion in Holmes’ world. Liu is very cute, likable and very watchable but just when we want to know and see more of Watson doing her thing (with the exception of the episode, Lesser Evils, where Watson gets a diagnosis of endocarditis correct) we get some very routine melodrama (like some very lame boyfriend troubles… ugh.) and the character ends up at a standstill. I do believe that they will eventually get more out of Watson but I feel that she is falling by the wayside at times and gets boring. In Liu’s defense, she is spunky and very smart. She plays Watson with confidence and gives as good as she gets. She is just not as edgy and interesting as she should be. I’m nitpicking though. The show is evolving nicely and I suspect the best is still yet to come. The cast is great. Quinn and Miller being the standouts and the locale is just wonderful. Another show other than Person of Interest (CBS also) that beautifully shows off my old stomping grounds, NYC! Elementary just needs a bit more self confidence to elevate it above the mundane “Police Procedural” conventions. 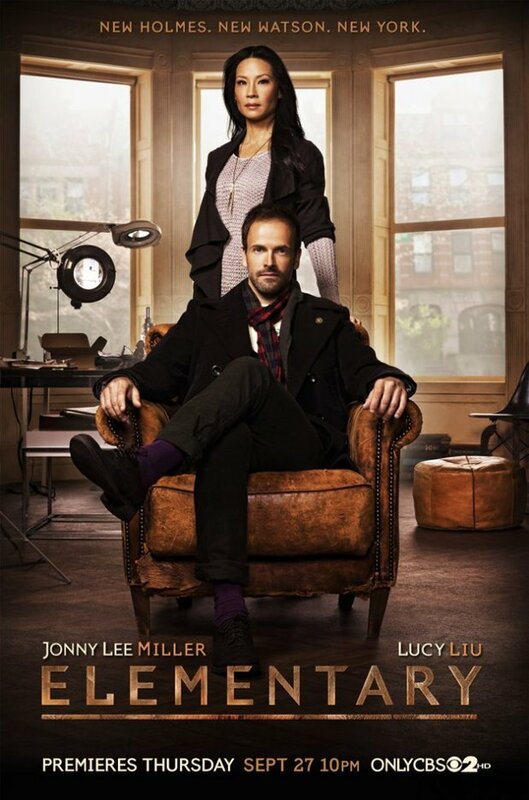 This entry was posted in Review, Vic's Reviews and tagged cbs, jonny lee miller, lucy liu, new series, police procedural, review, sherlock holmes, television series. Bookmark the permalink.